At 31, I came to comics relatively late. Yeah, I read some kiddie comics like Richie Rich and Lil' Devil when I was a kid, but real comics, with superheroes and bad language and what have you? That didn't come about until my mid-20s. My introduction to comics came from the Buffy the Vampire Slayer Season 8 run, as I had just finished plowing through Buffy on DVD and wanted, nay needed, more. Then my friend told me to read Ultimate Spider-Man, and then I discovered Runaways, and then Watchmen, and then it was all over for me. I was hooked and I had another money pit hobby. I've come of age with comics mostly with Marvel stuff, and almost exclusively in the Ultimate universe (Marvel's attempt at rebooting from 10 years ago). I've tried a few times to do DC titles, but Superman bores me and I find Batman to be completely unlikable (and yes, I've read the Frank Miller stuff, thanks). Yeah, I tried some of the Infinite Crisis stuff in an attempt to get on board with some of the DC heroes, but no dice. Only one DC title caught me (and I'll be talking about that in detail once the first trade for the New 52 comes out for it), and I had largely put it aside. The New 52, however, works perfectly for a reader like me - I have a bit of an idea as to who the characters are (for the most part), and I can go in with very few preconceptions or biases. I know why there's frustration with reboots (which is why I prefer Marvel's version, even if they've redone the Ultimate universe three times), but this is a Good Thing. 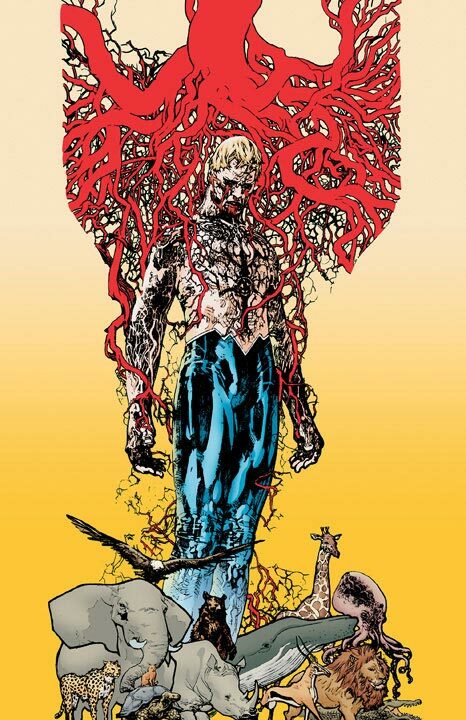 This brings us to Jeff Lemire's take on Animal Man. Lemire is arguably best known for his brilliant, creator-owned Sweet Tooth, and when I heard he was going to be taking on one of the reboots, I looked it up right away. The problem? I had never heard of Animal Man before. He's certainly not a top-tier DC hero, he's unlikely to get his own movie anytime soon, and looking him up, well...he's a superhero that can temporarily use the powers of animals. Great. What have I gotten myself into? One thing that jumps out to begin with when you sit with the new version is that the artwork is very unsettling. This threw me a little bit, if only because we're used to the classic stuff and I assumed a reboot for Animal Man would be a little different. While Travel Foreman, the artist on this run, is not involved with Sweet Tooth, I was surprised that the overall aesthetic appeared to hold over a bit - things are a little jarring, and they don't feel right. The interesting part of Animal Man in this incarnation is that, at least so far, it's not a traditional superhero tale. Buddy Baker is definitely heroic, but he's reluctant - reluctant because he seemingly dislikes the impact animals have on him and his power. We don't get an origin story as much as get tossed in the middle of a situation, which is a curious choice until you realize why the setup has to be that way, and that's because of the almost Lovecraftian horrors that await Baker and his family. Baker, following use of his powers, begins bleeding from the eyes. We quickly learn that Baker's four-year-old daughter is predisposed to supernatural interaction with animals as well. She plays with animal carcasses and skeletons, and she's speaking a lot about "the red" and whatnot. This quickly begins to impact Baker in absolutely horrific and terrible ways, as well as those around them, including folks who appear to be monsters themselves. What follows is really, really creepy. And awesome. Did I mention that yet? No? Well, it is awesome. Lemire successfully balances that line between creepy and cool, and it feels like a creepy, classic horror comic tale in a lot of ways, while still having that modern touch. The artwork really balances between the bright colors and ideas expected in a superhero comic and exploits them in a terrible, wonderful fashion. It's solid. The best part, for me, though, is that it takes such a hokey, silly concept, and turns the entire idea on its head. 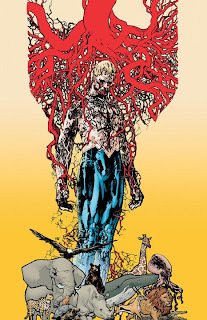 I truly don't know what to expect from Animal Man as a series, and that's as exciting as it is unanticipated - being surprised by comics is not something that happens very often for me in mainstream titles, and this is going places I never expected. Definitely check out this run of Animal Man. The trade was released this month, so you still have some time to get ahead on one of the more unique comic titles you're going to find in the new reboot.